Concept: By 2050, it is likely that the mean sea level in the New York area will rise by between six inches and two feet as a result of warming oceans. Sea level rise is merely the static part of warming’s impact. The dynamic aspect is the flooding produced by storm surges. Because of higher water levels, it is likely that flooding resulting from severe storms — hurricanes and Nor’easters — will increase dramatically. What is currently considered the one-hundred-year storm flood will recur every nineteen to sixty-eight years, and the five-hundred-year storm flood may recur closer to every one hundred years. conditions of climate change. Currently nearly every rain event in NYC results in CSO overflow severely damaging the estuarine ecology of the waterfront, and thus threatening the health and happiness of the people of New York City. Atmospheric landscape infrastructures is a visionary design proposal which conceives weather as a tectonic experience to create a new type of urban landscape. The separation between hydrology, people, ecology, and infrastructure is dismissed, and integrated into one system. Union Square was chosen as the site catalyst for it’s long history of being an important collection point for people and events regarding political and social change. The movement of people and water become synonymous as bike parking and pathways grow rhizomatically throughout the city in pair with a new decentralized stormwater system that captures and biofiltrates water from point sources. The result of this system surgically spreading throughout NYC overtime will lead to meeting PlaNYC’s goal of opening 90% of the city’s waterfront for recreational use by 2030, reducing the carbon footprint of the city by increasing bike infrastructure and drastically reducing auto travel, increasing the city’s livability by reducing heat island effect and providing safe and abundant drinking water, and preparing NYC for climate change impacts by creating an adaptive and responsive urban landscape system. The capacity of the new integrated infrastructure grows exponentionally as the system itself grows. Like the rhizome, as new zones form and become part of the system the responsibility for biofiltration becomes decentralized, releaving the burden of the overall system and increasing performance. 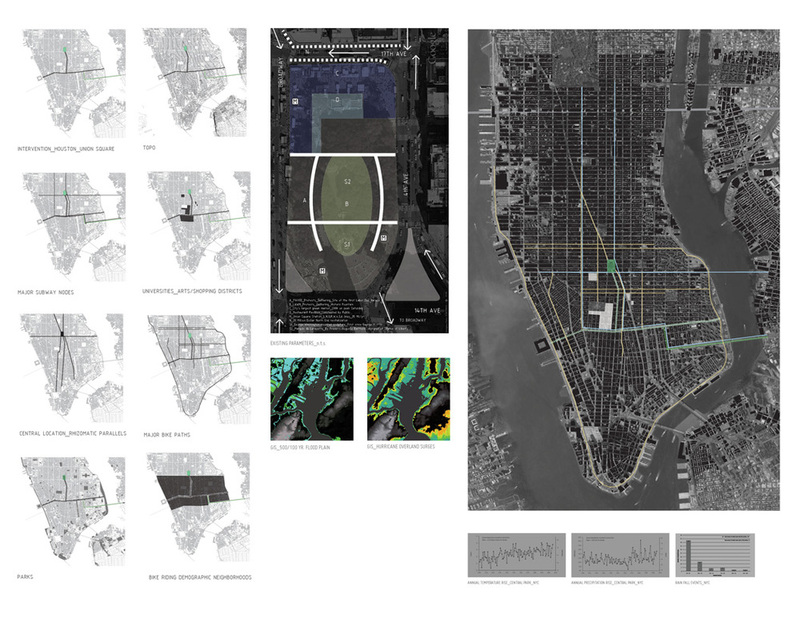 The design has the capacity to biofiltrate all .5” rain events that occur within a year in NYC, 62% of the total rainfall. Capturing point source stormwater at this interval is critical. Smaller rain events carry pollutants to CSO’s with less dilution, increasing the toxicity at CSO outfall zones. Water currently captures building roof runoff, but as blue and green roofs become more prevalent surrounding any atomospheric landscape infrastructure system, it will eventually double its filtration properties. The filtration operates on a slight tiered system, with each level designed to withstand multiple levels of storm surge activity. When capacity is reached, the overflow simply falls into the next tier. A 36” deep gravel layer slows the water through filtration for a 30 hr. period, and then released back into the existing system when no longer overburdened. As the new infrastructure rhizomatically grows however, the intention is for a completely separate stormwater system. The water captured eventually returning tto the waterfront, but only before it is cleaned and utilized for the necessities of the the people of NYC. The bike parking system does not consume space but is the result of the creation of new space. The rising planes of the connecting bridge structures reconfigure the spatial identity of dense urban space and provide the capacity for large quantities of bike storage. The system itself acts as a structural and sculptural piece, when aggregated in masses it forms support for elevated forms and plays with filtered light and ground plane shadows.